Lenovo 3000 N100 notebook computer is designed for home users and small business customers who want to use the laptop for personal and business use, with emphasis on multimedia capabilities such as forward facing stereo speakers, an integrated microphone for playing and recording audio, and an integrated combo or DVD recordable drive. 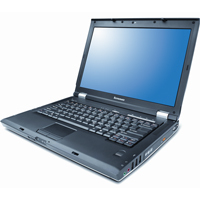 Lenovo 3000 N100 features Intel Core Duo processor, 14.1″ or 15.4″ widescreen TFT LCD, nVidia GeForce Go 7300, 802.11a/g WiFi, flash card reader, weighs 6.1 lbs and runs on Microsoft Windows XP Professional. BIOS Magazine (link dead) reviews Lenovo 3000 N100 laptop computer and concludes that N100 is a better system than the C100, offering good processing power, a nice set of features, and an attractive price tag. It’s no ThinkPad and a battery life of 2h 44m isn’t going to set the world on fire, but Lenovo’s first widescreen laptop will give some other big players (Dell, HP and Toshiba) a run for their money.